A parked vehicle and an electrical box were damaged Saturday after a woman allegedly struck them with her vehicle and fled the scene, according to police. The incident reportedly took place near a home on Big Dipper Drive in Province around 5 p.m., May 26. 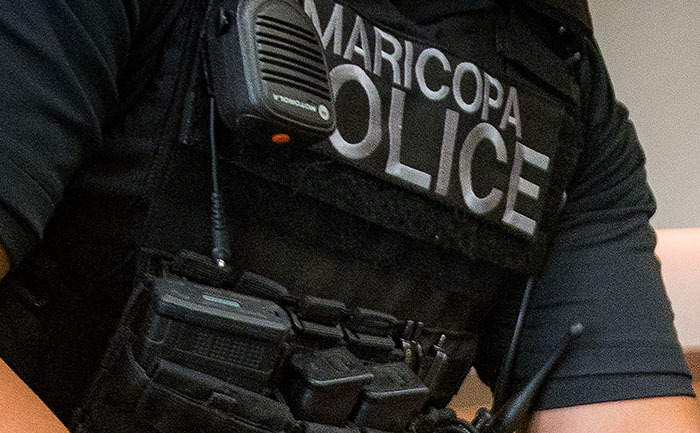 Witnesses told the Maricopa Police Department a vehicle hit and subsequently pushed a Ford pickup truck approximately 10 feet into an electrical utility box owned by Electrical District No. 3. The suspected at-fault vehicle was described as a silver SUV being driven erratically in the area. The truck received damage to its rear passenger-side corner, taillight and bumper. The electrical box was “broken off from the concert base it was on,” according to an MPD police report. About an hour later, MPD officers located a vehicle in the Villages subdivision matching the description given by witnesses. They eventually made contact with the alleged driver, Rebecca Wallace, at a residence on Ryans Trail. There, officers noted damage on the passenger side of Wallace’s Chevy Equinox that “matched the damage to” the Ford pickup in Province. Police said Wallace allegedly admitted to being involved in the accident. However, she then reportedly told an officer she no longer wanted to speak to police. “(Wallace) was also found to be impaired,” the report alleged. MPD forwarded charges of class 6 felony criminal damage for the estimated $1,000 worth of repairs to the truck and utility box; failing to fulfill duty on striking an unattended vehicle, a class 3 misdemeanor; and striking a fixture on a highway, also a class 3 misdemeanor. A DUI charge is pending on the results from Wallace’s blood sample, according to the report.